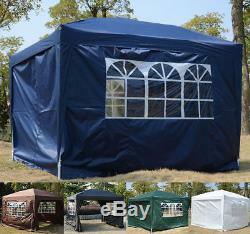 New Garden Heavy Duty Pop Up Gazebo Marquee Party Tent Wedding Canopy 4 Sizes. Colour: White, Green, Blue, Black, Coffee available Size: 2 x 2 (m), 3 x 3 (m), 3 x 4.5 (m), 3 x 6 (m) available 2 pane style and 2 zipped Top material: Oxford Side wall material: Oxford The thickness of the steel pole structure 3 x 4.5 (m), 3 x 6 (m): Top steel pole / Cross steel pole: 10 x 18 x 0.5 (mm) Leg steel pole / Support steel pole: 30 x 30 x 0.6 (mm) / 25 x 25 x 0.6 (mm) The thickness of the steel pole structure 2 x 2 (m): Top steel pole / Cross steel pole: 10 x 18 x 0.5 (mm) Leg steel pole / Support steel pole: 25 x 25 x 0.5 (mm) / 20.7 x 20.7 x 0.5 (mm) Please note that we will not accept responsibility for damage caused to this item due to wind, rain and weather conditions. Be aware that the actual colour of the item may be slightly different as shown on the above photos due to the screen resolution matter. We are sorry for that we won't accept any responsibilities for the damage of this product caused by any adverse weather conditions. This New Easy Pop up Set Canopy package is a great, no-fuss outdoor shelter. It is Ideal for family parties, weddings, picnics, sports events, outdoor vendors, craft fairs, job sites and camping trips. This easy up canopy provides easy set-up and take down in less than one minute. It also comes with a portable carrying case. This canopy has a high quality Powder Coated Steel Frame which has High Strength and is suited for winter time. Comes with portable carrying case Water resistant & rust resistant canopy Effective UV performance Heavy duty cross truss roof design Requires 2 people to assemble Powder coated steel frame With water strip and silver coating Great for commercial and recreational use Side walls can be easily removed and can be easily added with Velcro attachments Contents included: Carry Bag 2 x 2 (m) or 3 x 3 (m) or 3 x 4.5 (m) or 3 x 6 (m) steel frame sidewalls Rope and Stakes You can also find gazebo leg weights in our shop!!! MH STAR verifiably manages retail globally with branches in US, Canada, Germany, Spain, Italy and France, we now welcome you to benefit from our prices in the UK. If you change your mind and wish to return the unused items to us, it must be done so within 30 days of the item being delivered. However, if you have any issues in regard to your order, we have a dedicated UK based customer service centre who will be delighted to help and resolve any issues that may arise. Thank you for shopping with us and we look forward to bringing you more great deals! The item "New Garden Heavy Duty Pop Up Gazebo Marquee Party Tent Wedding Canopy 4 Sizes" is in sale since Wednesday, March 6, 2013. This item is in the category "Garden & Patio\Garden Structures & Shade\Gazebos". The seller is "2011homcom" and is located in London.